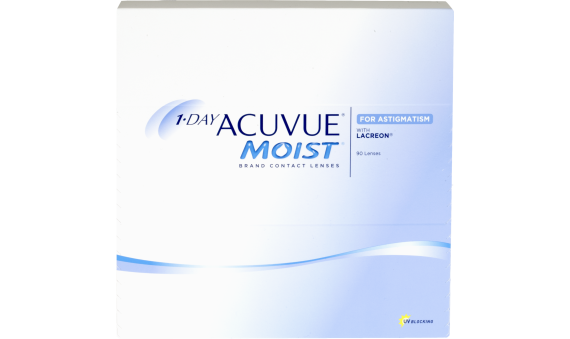 1-DAY ACUVUE MOIST® for ASTIGMATISM offer the convenience of no solutions and no lens cases. Truly innovative BLINK STABILIZED® lens design and the remarkable comfort of LACREON® Technology to create a lens like no other. These lenses give you consistently clear and comfortable vision from the moment you put them in, to the moment you discard them at the end of the day. 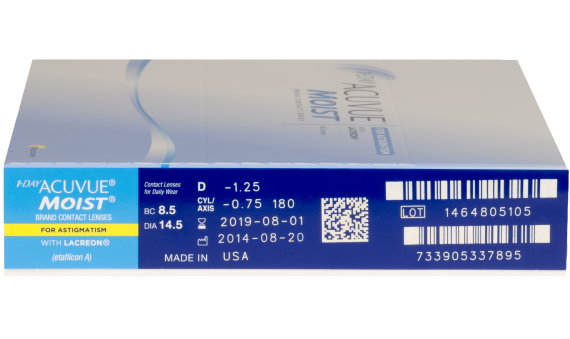 1-DAY ACUVUE MOIST® for ASTIGMATISM lenses help protect the covered portions of your eyes by blocking at least 82% of the UV-A radiation and 97% of the UV-B radiation.